A 25-year-old man, Patrick Obeng Hamza died after competing in an akpeteshie drinking contest at Ntankoful in the Sekondi-Takoradi Metropolis. 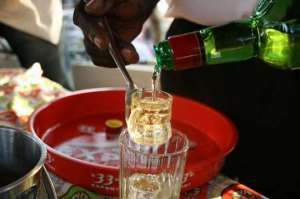 Akpeteshie is a locally distilled alcoholic drink. The unfortunate incident happened yesterday at about 11: 15am. The deceased was said to have taken in about two Fanta bottles of the hard liquor. According to sources, Hamza, an unemployed, collapsed in the process of taking another 'quarter' of the drink. His challenger who was said to be unconscious was revived, having been made to drink mashed kenkey by colleagues who were around. Eyewitnesses told Takoradi-based Connect FM that though Obeng Hamza was rushed to a Clinic at Ntankoful, he was pronounced dead on arrival.